I believe it was 1944 when Coppertone sunscreen came out with the very first sunless tanning product, called QT or Quick Tanning Lotion. Since then the concept of being able to literally rub on a tan has become more and more popular. If you are old enough to remember QT, then you may also remember the incredibly orange skin hue that this Coppertone lotion produced? Starting with a pharmacist who created a special tanning lotion that had the ability to darken the skin without sunlight, its first big hit product was Coppertone Girl, which used the now iconic image of a young, blonde girl having her bathing suit bottom playfully pulled down by a cute Cocker Spaniel. This ad helped put Coppertone sunscreen on the map and has been fairly well known ever since. 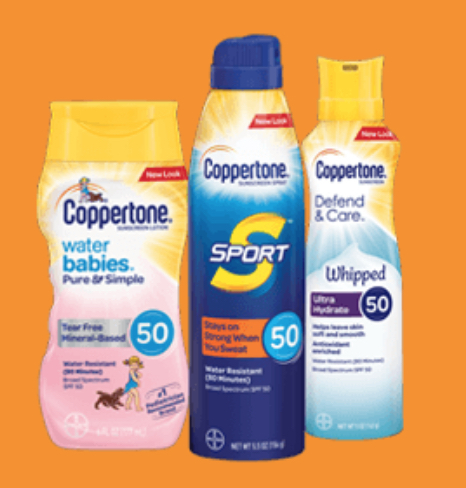 Coppertone formulas focus on all ages and skin types and can be found in many different retail outlets and online. However, I find this can be all too confusing actually, with many very similar products. Looking into the formulas themselves - or the active and inactive ingredient lists - one can see more or less which ones to select, if you know what the ingredients are! Coppertone's Sport sunscreens are all about what I try desperately to avoid using. Although there seems to be about 24 different Sport products and so they vary quite a bit, predominantly they contain 100% chemical active ingredients, including Avobenzone. Most are toxic in some way or another - see EWG's rating. Plus it provides many people with a false idea that they are 100% protected when in fact they can never be fully protected. See the chart below. Coppertone sunscreen: mineral based options? 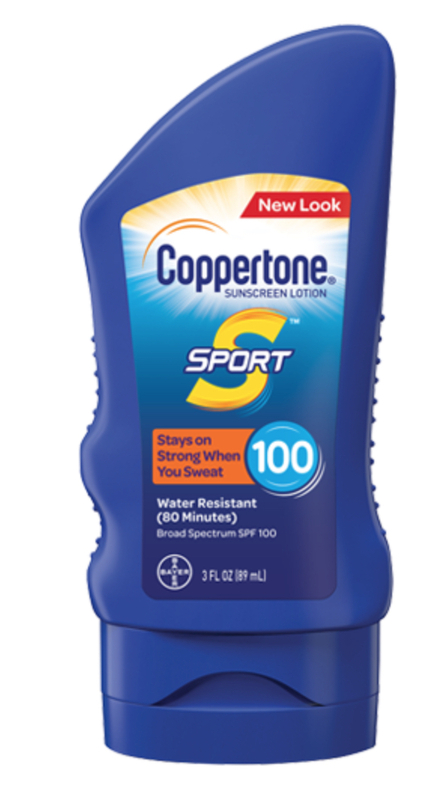 Coppertone do however, have a mineral based sunscreen using zinc oxide sunscreen - called Coppertone Sensitive Skin Sunscreen Lotion SPF 50, which is also "fragrance free". However, it's active ingredients include 14.5% Zinc Oxide, 7.5% Octinoxate, and 5% Octisalate. This is a relatively high amount of Zinc Oxide, which is fabulous for sensitive skins. 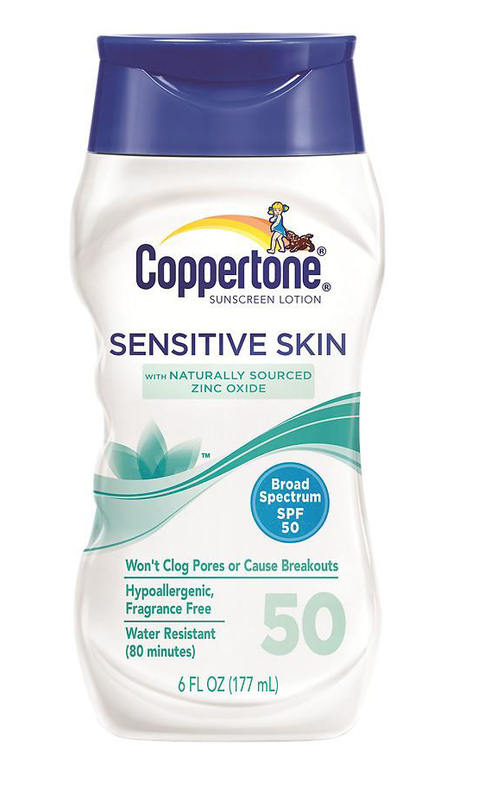 However, since this Coppertone sunscreen contains chemical sunscreen ingredients (octinoxate, which has estrogenic effects and octisalate, which is a penetration enhancer allowing other chemicals to penetrate deeper into the skin), I believe the words "sensitive skin" is not a very apt description for the product. 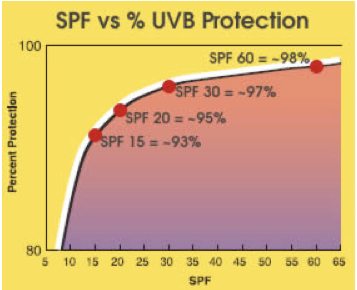 If you have truly sensitive skin, you more than likely can't tolerate any chemical sunscreen ingredients, including avobenzene or oxybenzone, another 2 chemical sunscreens to avoid. Parabens - the worst being Methylparaben, with "Developmental/reproductive toxicity, Ecotoxicology, Endocrine disruption, Allergies/immunotoxicity"
A formaldehyde releaser - Diazolidinyl urea with "Cancer, Allergies/immunotoxicity, Contamination concerns (FORMALDEHYDE)"
PEG-12 DIMETHICONE CROSSPOLYMER with "Contamination concerns (ETHYLENE OXIDE, 1,4-DIOXANE), Organ system toxicity (non-reproductive)"
CETYL PEG/ PPG-10/ 1 DIMETHICONE with "Contamination concerns (ETHYLENE OXIDE, 1,4-DIOXANE), Organ system toxicity (non-reproductive)"
PROPYLENE GLYCOL with "Enhanced skin absorption, Allergies/immunotoxicity, Irritation (skin, eyes, or lungs), Organ system toxicity (non-reproductive), Use restrictions"
There really are so many other sunscreens out there that not only provide great broad spectrum protection, they have healing properties too.